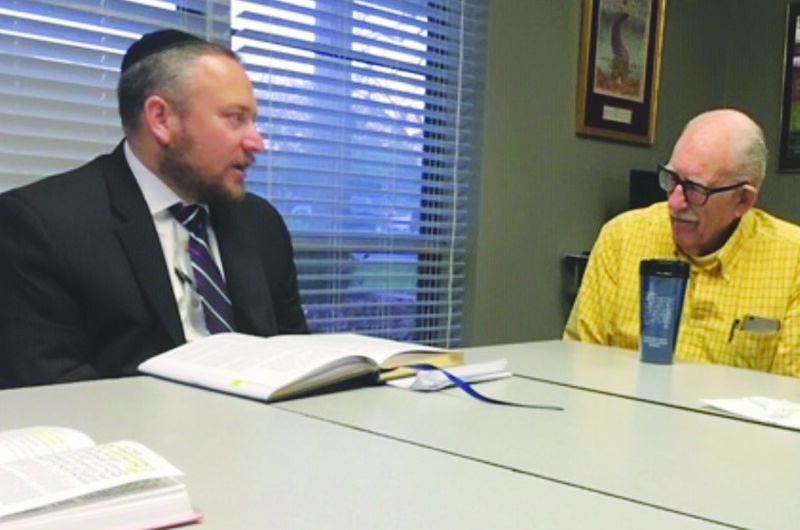 Search Results | "Silverthorn "
“I have students who quote Socrates and Plato in discussions of Torah and it isn’t only the students who learn something each week,” said Rabbi Deon Nathan (left), leader of the Tuesday morning men’s Torah study group. Rumor has it that the true breakfast of champions starts at 7 a.m. every Tuesday. At that time, a community men’s Torah study group gathers at the Dallas Area Torah Association (DATA) offices on Forest Lane in Dallas. Whether a dozen or four attendees show up on any given morning, the conversation and learning are guaranteed to be spirited, engaging and meaningful. The class, taught for the last four years by Torah Day School of Dallas CFO and COO Rabbi Deon Nathan, takes place at DATA, but is an unaffiliated program. Participants come from congregations throughout the community and the class — for which there is no charge — is open to men of all ages. The coffee and baked goods (provided by Rabbi Deon’s wife and daughters) deliver a bit of extra get-up-and-go for the early meeting time. But, for most who stop in on their way to work, the inspiration the class provides is more energizing than any caffeine pump. Nathan, a Dallas native and the son of Sandy and Michael Nathan, was a member of the first class of Yavneh Academy, before transferring to Rabbi Oscar Fasman Yeshiva in Skokie, Ilinois. He earned his bachelor’s degree in Judaic Studies from Hebrew Theological College in Chicago before moving to Israel. During his 13 years in Israel, he earned his MBA in International Business at Bar-Ilan University and worked in private banking and with Israeli startups. Nathan is a certified mohel, sofer STAM (scribe), shochet and mashgiach kashrus (kashrut supervisor). He is the husband of Yehudit and father of seven. “Somehow the class always hits notes of politics and religion, but the conversations are open and honest and always of the utmost respect,” Nathan said. First spearheaded by Joel Shickman, of blessed memory, and Congregation Shearith Israel’s Rabbi Elon Sunshine (no relation to CSI’s current senior rabbi), the group met at a coffee shop. Throughout the years, the learning has been led by many rabbis, including Bill Gershon, Joe Menashe, Adam Raskin and Yoni Sonnenblick. Nathan provides the group with articles and readings that test the state and future of progressive Judaism, and the group often challenges his observant beliefs in the laws, as they apply to modern Jews. Prager spent much of his career as a medical researcher and a professor of medical ethics and philosophy to medical students, and retired only at the age of 92. He said he enjoys the company of the mix of men in the class. Many of the students have remained constant throughout the two decades. The group began with study of the weekly Torah portion, but soon embarked on a long-term journey, and completed reading the entire Tanach — Torah, Prophets and Writings — word by word, first in 2012. They are now revisiting the Prophets and studying Samuel I. Participants say that, even though the material is the same, a new leader means different discussions. For information on joining in the class, email dallasfish@aol.com or deon@thenathanfam.com or call 214-923-5101. 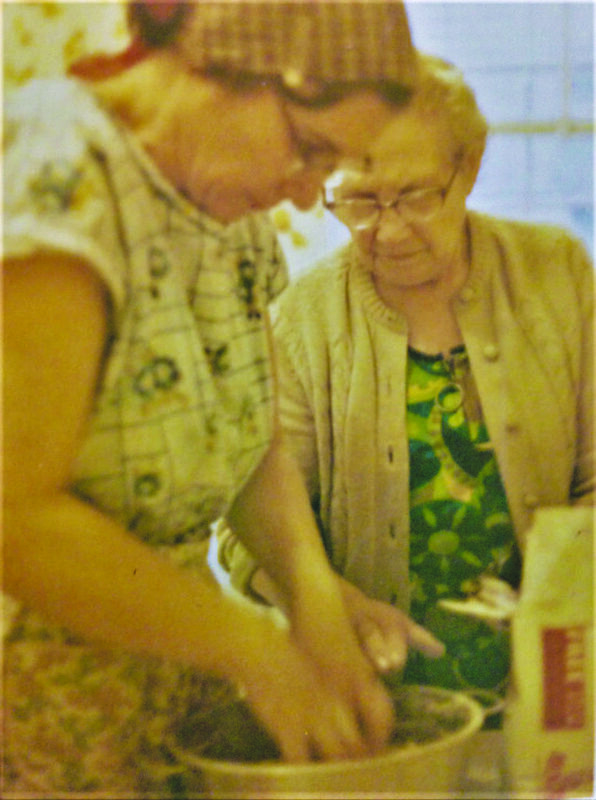 Monica Ribald founded Please Visit Me 613 in memory of her mother, Helena Stein Tenenbaum, left. Tenenbaum, with her mother, Esther Chana Sandlarz, both of blessed memory, taught Ribald that a smile is a gift that can be opened over and over. “Hello” and “how are you” are among the first words we learn. And, how to find those in need of a “hello” and more is what is behind Please Visit Me 613 (PVM613), created by Monica Ribald. Ribald says those she visits have limitations of illness, disability, or for whatever reason no transport, and they are without engagement. Living for company on the weekends, or for when “it’s convenient,” makes for long and lonely days. People wait – and wait – and wait, alone. “My mother became very hard of hearing in her later years and people stopped visiting with her because it was difficult,” Ribald said. She recalled her friend, Gail Stolovitsky, who always made time to stop in. The visits brightened her mother’s day and kept her cheerful. That someone else besides Ribald and her husband cared was huge. It is in memory of her mother, Helena Stein Tenenbaum, that Please Visit Me 613 was founded. A New Yorker through and through, Ribald moved to Dallas in 1977 with her husband Max. Ribald’s personality is even brighter than her artwork, which includes the illustrations for Helen Waldman’s book “Polly’s Pipers” and many privately commissioned drawings and paintings. The mother of Chad (Risa), Yanki (Marrisa), and Itzy (Ilana) and the grandmother of Adam, Anna, Ari, Ariella, Charlotte Grace, Claire, Dasi, Efrat, Eitan and Esther, Ribald is the “Jewish Bubbie” defined: not just to her own grandchildren, but to every student — of any age — who has ever crossed her path, and that includes the thousand-plus children who came through her art classes at Akiba and Yavneh academies. “Do unto others” might not be among the top 10 commandments, but built within our 613 commandments, it rings true many times. Bringing conversation and laughter, or just being with someone, for whatever length of time, does good for the person visiting, and the visitor. “Monica underscores the connectiveness we have as Jews, the sense of responsibility we all have,” said Rabbi Howard Wolk, the community chaplain at Jewish Family Service. Ribald has been friends with Wolk since the two were in their early teens. “We all left Egypt together and we need to remember that, on many levels,” Wolk said. Ribald is excited to share PVM613 with the community and hopes others will sign up to go out. She already has a core making their way to homes, hospitals, assisted living and rehabilitation facilities, many of whom have had personal experiences leading them to want to participate. There are no parameters or rules to the visitation. It is whatever works and for however long, and however often a schedule allows. “I was raised to care. It’s just that simple and it’s really easy, and there are so many people here who have no one, no family close. Or they do, but their families are busy, so essentially, they’re alone. A visit can be 15 minutes or it can be hours,” Ribald said. To register either as a Please Visit Me 613 visitor, or on behalf of someone who would appreciate a visitor, email pleasevisitme613@aol.com. A hands-on CEO, Jewish Family Service’s Cathy Barker appreciates that almost every day on the job allows the opportunity to connect with those receiving support. 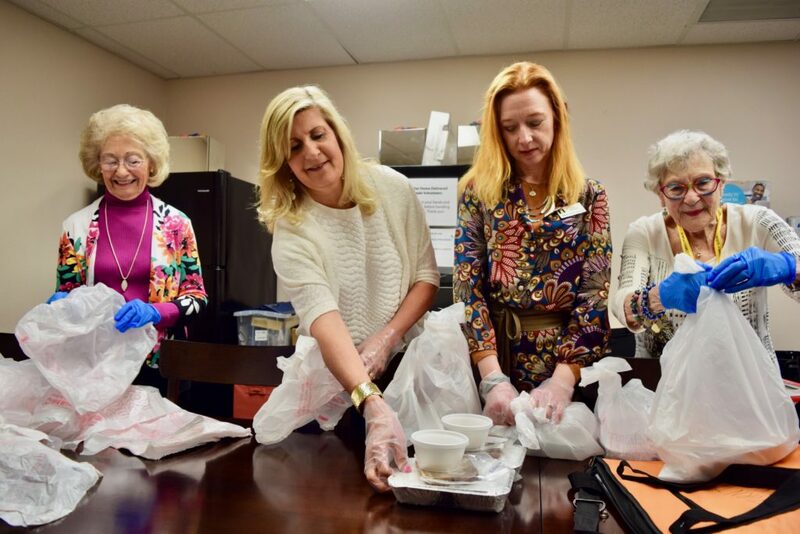 Barker is prepping meal deliveries with volunteer Nora Silverfield, JFS’ Kosher Home Delivered Meals Coordinator Lyz Worlein and volunteer Ina Gartenberg. According to Cathy Barker, everyone who comes to the organization has a story to tell. “And we’re honored to be part of that story,” she said. 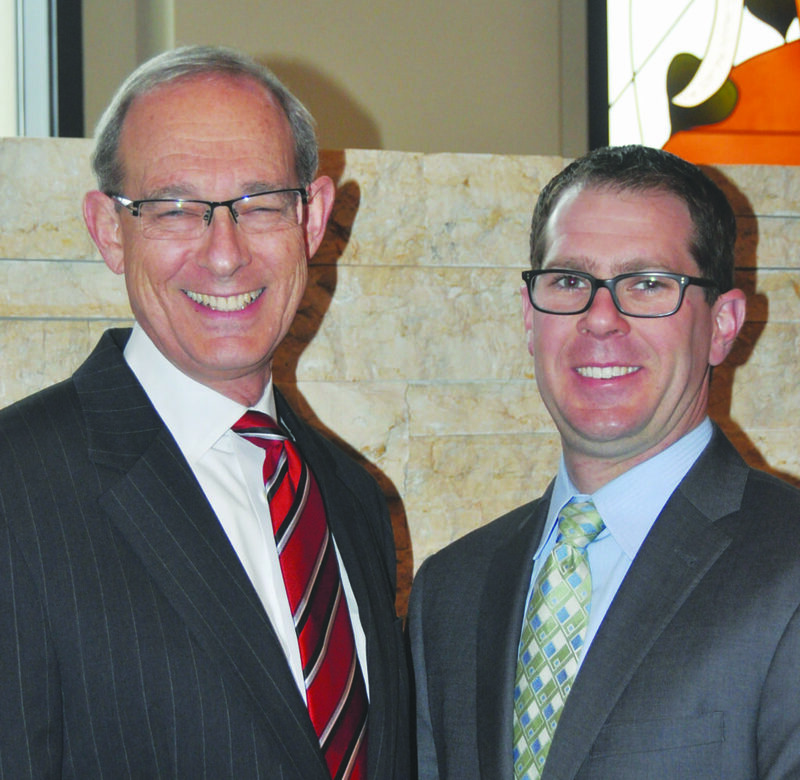 Barker, the new CEO of Jewish Family Service, spent the last eight years as the organization’s chief operating officer, chief development officer and assistant executive director, before taking the leadership reins. The daughter of Donna and Robert Brunkenhoefer, Barker, along with her siblings Blake, Craig, Donna and Brad, was raised in Corpus Christi. She met her husband, Don, while the two were students at Texas A&M. She earned her undergraduate degree in psychology, then attended Our Lady of the Lake University in San Antonio, where she received her master’s degree. She began her career as a licensed professional counselor in both hospital and private practice settings before embarking on 20-plus years of leadership in the nonprofit sector leading local and national social service and mental health organizations. Barker and her husband have two sons, Dalton and Riley, both current Aggies. Outside of the office, Barker enjoys exercising, watching Aggie and Cowboys football, dinner and time with friends and family, and attending concerts of the bands of the 80s. To Barker, raised Catholic, it is the values one learns and lives that make the human being. Serving, as JFS does, the greater community without regard to race, ethnicity, religion or the ability to pay, she believes strongly in values held close to those of the Jewish faith. “I’m proud to have been successful at building a new source of unrestricted operating support (The Resale Shop), identifying and securing new grant revenue streams through community partnerships by bringing services to underserved areas of the community, and by engaging board members so they can see, firsthand, their efforts at work in the lives of others,” Barker said. During her time with JFS, Barker worked with former CEO Michael Fleisher to lead strategic objectives that increased operational and program effectiveness through staff recruitment and retention. She also worked to identify and implement process improvements, resource development and fiscal management of the agency’s almost $8 million budget, its three service locations, The Resale Shop’s two locations and 94 staff members. Assured and secure in Barker’s role is Michael Kaufman, president of JFS’ board of directors. He first joined the board just before Barker came to the organization, worked with her on many projects including The Resale Shop, and he’s seen her grow into the role. Through JFS’ 150 unique services and its more than 1,600 volunteers, serving more than 28,000 hours last year alone, it is all that happens each day within the agency’s walls of which Barker is proud. “I didn’t know where the path would take me, but after my own life experiences, I wanted to be part of healing others and I’ve found that in a career of varying roads,” said Barker, who worked in a psychiatric hospital, founded Turning Point Counseling Services, was executive director of Family Services of Plano, and worked with the Boys & Girls Clubs of Collin County, among other nonprofits, before arriving at JFS. “I landed at JFS in 2010, and I’m grateful to be home where so much of what we do happens truly around the clock,” she said. Yavneh Academy of Dallas has announced its Schultz Scholars for the 2018-2019 academic year. The seven students include two graduating seniors, three juniors, a sophomore and a freshman whose academic achievement and co-curricular leadership exemplify the best of Yavneh Academy. Congregation Shearith Israel SISterhood will honor one of its lifelong members, Carol Aaron, at its Torah Fund Brunch at 11:30 a.m. Sunday, April 7, at the synagogue, 9401 Douglas Ave.
Carol has been active at Shearith Israel as a lay leader and generous benefactor. A philanthropist, volunteer extraordinaire and all-around go-getter, she is known for her love of family (she is the mother of Dawn and Todd Aaron, Nicole Blue, Angela Horowitz and Doug French, Erica and Craig Robins and Tracy and Clay Aaron) and her passion for ensuring the future of Dallas’ Jewish community. Most notably, she and her husband Steve Aaron provided the naming gift for the Aaron Family JCC (Jewish Community Center). She has also served the JCC as vice chair and as chair of major fundraising. Most recently, Carol has been deeply involved with the Legacy Midtown Park project as co-chair of its capital campaign committee and chair of its board of directors. She has been deeply involved with the Federation of Greater Dallas as well. She has served as the pacesetter chair, campaign chair, president and chair of the 100th Anniversary Celebration. Aaron has served on boards and advisory committees for many organizations, including: CHAI, The Legacy Senior Communities, Dallas Jewish Historical Society, Solomon Schechter (now Levine Academy), Jewish Medical Center in Denver, Dallas Holocaust Museum, Dallas Jewish Community Foundation, and Shearith Israel. She received the Kipnis-Wilson/Friedland Award in 2004, the BBG Alumna of the Year Award in 2009, and the Husband and Wife Humanitarian Award from the Dallas Holocaust Museum. Cost of the New Orleans-style Jazz Brunch is $36 plus a minimum donation to the Torah Fund Campaign. To RSVP, visit www.Shearith.org. Congregation Anshai Torah is getting ready for the 10 plagues, the 40-years in the dessert, the four questions and four cups of wine (plus one each for Eliyahu and Miriam) with its annual Women’s Miriam’s Cup and Men’s Steak and Scotch events. All women of the community are invited Thursday, April 4, and men Thursday, April 11, both events beginning at 7 p.m. at Congregation Anshai Torah. During the Steak & Scotch, Rabbi Stefan Weinberg and Rabbi Michael Kushnick will preview the Seder for the men, also providing insight to the texts of the holiday. Dinner and drinks provide the background, the rabbis the foreground for home Sedarim. Both events include dinner, drinks and dessert. For more details or to RSVP, call 972-473-7718 or emailreceptionist@anshaitorah.org. Congregation Beth Torah is offering a new session of Chocolate Hebrew, the innovative crash course in reading Hebrew, beginning Saturday night, March 30. Chocolate Hebrew, which is open to the community, uses a nonthreatening, fun and multisensory approach to take the mystery out of the Hebrew alphabet in just 13 hours of classes over two weeks. It is taught by Ruth Precker, the only teacher in Texas trained and authorized to teach the course. The cost is $200. For more information, call Beth Torah at 972-234-1542 or log on to www.hebrewdallas.com. “She took the plunge to participate alone and represent our chapter and we really appreciate her,” Leah Dubrawsky, director of Friendship Circle of Dallas, said of Shira Ruttenberg. 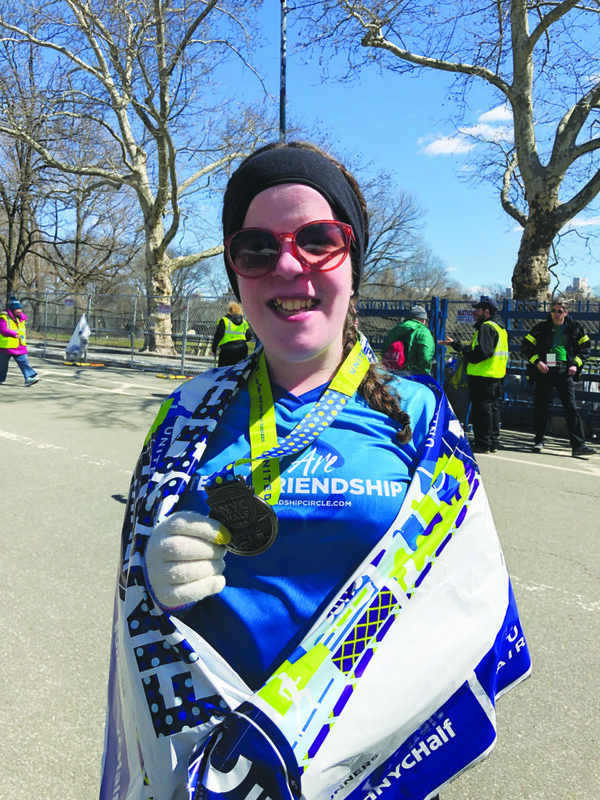 There were 30,678 runners registered to participate in the 2019 United Airlines half-marathon Sunday morning, and the lone ranger representing Friendship Circle of Dallas was 16-year-old Shira Ruttenberg. Starting at 7:30 a.m. in Brooklyn, Shira, who trained four times a week, traversed the city in the NYC Half. Across the FDR Memorial Bridge, to 42nd Street, she crossed the finish line in Central Park 13.1 miles later, her heart even more full. “This is my first real race and I’m really excited,” said Shira before the competition. She had family and friends cheering her on. Surpassing her goal, she hopes to raise more, At presstime, with $2,287 Shira is in fifth place of all Friendship Circle, International participants. The majority of the money she raised will support Friendship Circle of Dallas. Team Friendship, of the Friendship Circle, International, affiliated worldwide with Chabad Lubavitch, runs the miles every day of the year, spreading their mission that every individual is deserving of love, respect, and most importantly, friendship. Around the world, the Friendship Circle brings happiness and companionship to children and adults with special needs by celebrating their individuality, as well as bringing energy, support, and peace of mind to their families. The Friendship Circle of Dallas hosts programs and activities throughout the year. On May 19, the Dallas chapter will host its first Walk 4 Friendship, and Shira has raised more than $2,000 to participate in that event. The Columbus, Ohio native is the daughter of Abigail and Yoni, and sister of Aliza. The family are members of Chabad of Dallas and Shira is a camper of Camp Stone in Pennsylvania. A sophomore and Student Ambassador at Fusion Academy, Shira participates with Yachad/The National Jewish Council for Disabilities and the Dallas Chapter of the National Council of Synagogue Youth. In her free time — rare for this busy teen — she enjoys baking, reading, traveling, ice skating and swimming. In the summer, she will travel to Israel as a part of Yad b’Yad, Yachad’s inclusive leadership experience. Shira began making mitzvahs as a second-grader at Akiba. 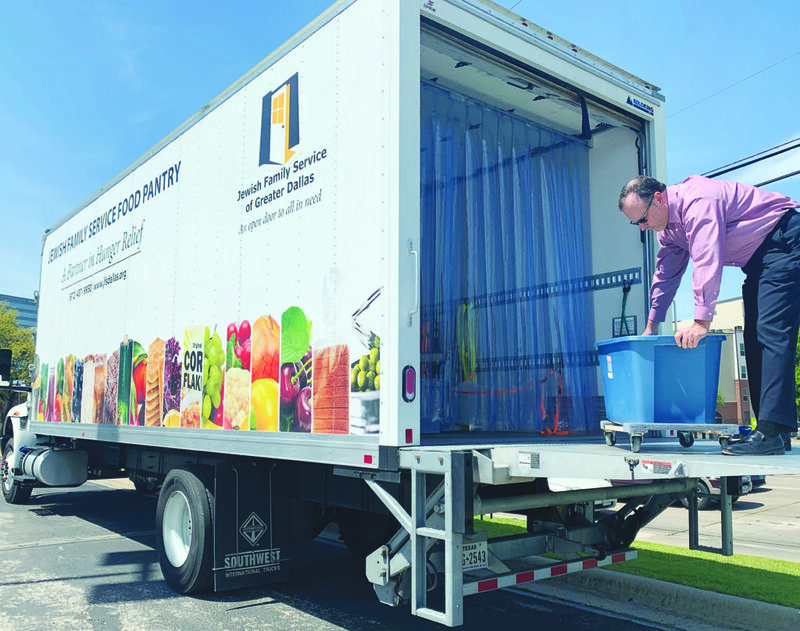 She helped spearhead collections, which Judy and son Jacob Wisch delivered to the community of Joplin, Missouri, after its devastating tornado. She’s has shared in many food drives for the homeless, for the victims of Hurricane Harvey, and she regularly delivers homebaked goods to the police and fire departments near her home. Shira, who began fundraising and training for the half-marathon last summer, sent a letter to friends and family, used social media, and turned to her school for support. Shira loves what Friendship Circle stands for. 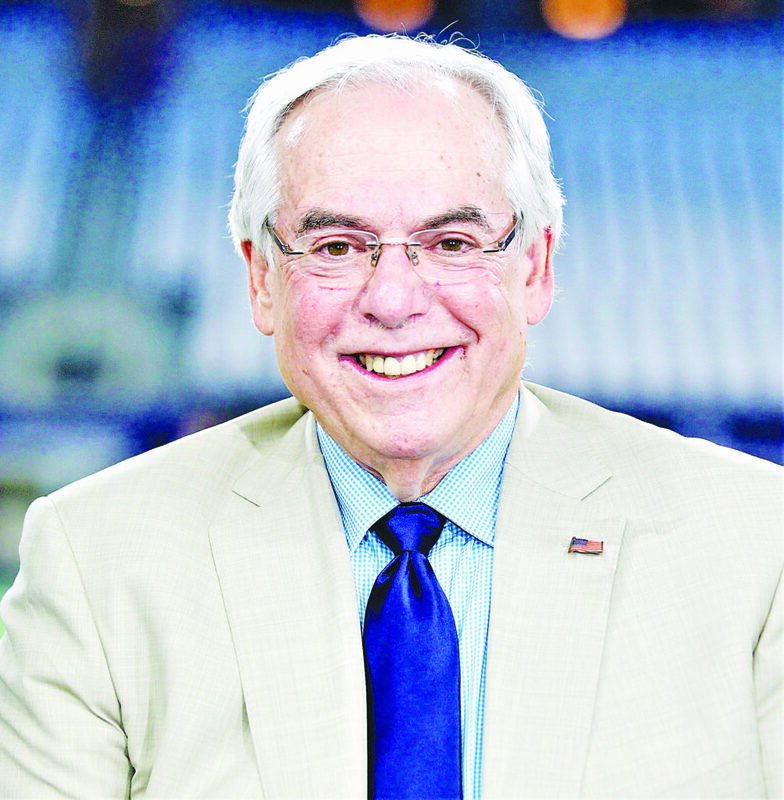 Brad Sham will be the master of ceremonies at Jewish Family Service’s Just for Show fundraiser April 30. Day after day, Jewish Family Service provides life-changing interventions to the people it serves. To support those programs and services financially, JFS will present “Just For Show,” featuring the improv comedy troupe The Second City, at 7:30 p.m. Tuesday, April 30, at The Majestic Theatre. Doors open at 6:30 p.m. Brad Sham will serve as master of ceremonies. Goldberg is co-chairing the event with his wife Sharon as well as Stefani and Gary Eisenstat and Greta and Howard Herskowitz. For more than 50 years The Second City troupe, with alumni that include Tina Fey, Chris Farley, Bill Murray and Keegan-Michael Key, has been presenting improvisational comedy. With a variety of theaters, training centers and full-time touring ensembles, laughter is provided around the world. The Second City is creating an original show for the evening, customized to spread joy relating to JFS and the Dallas Jewish community. Sham said that The Second City is a favorite stop of his when he heads to the Windy City. “It’s on my ‘to do’ almost every time I get to Chicago and I know Just For Show will be a real treat,” said Sham, known as “the voice of the Dallas Cowboys,” broadcasting his 41st season for the team this year. The broadcaster commended JFS for its monumental work for the community, with more than 150 programs, groups and services. Serving its mission every day, JFS’ employees and volunteers provide professional, effective and affordable mental health and social services that promote lifelong self-sufficiency and well-being for anyone in need regardless of religion, race, ethnicity or ability to pay. “The tremendous work that Jewish Family Service does across the community is important work to be understood and supported. All they had to do was ask and I’m honored to be a part of this special night,” said Sham. JFS, nationally accredited in all service areas by the Council on Accreditation, is a United Way Agency and community partner of the Jewish Federation of Greater Dallas. With more than 40 community collaborations built over its 68 years, Jewish Family Service offers wraparound care to address multiple needs, its sliding scale, even to zero cost, making a difference and changing lives for more than 13,000 people each year. JFS encompasses more than 150 different services, groups, programs, and specialists in the areas of mental health support for all ages; food pantry; older adult needs; career and employment; family violence intervention; and emergency assistance. In 2018, 1,604 volunteers gave 28,454 hours to enhance and enable those programs to succeed. Just for Show’s honorary co-chairs are Sheryl and Gordon Bogen, Lisa and Neil Goldberg, Beverly and Joe Goldman, Barbara and Clive Miskin, Hannah Kay and Harlan Pollock, Barbara and Stan Rabin and Barbara and Donald Zale. Tickets, which include kosher snacks, are $150 with a limited number of young adult (ages 21-35) seats available at $50/person. To purchase tickets, visit jfsjustforshow.org. For more information or sponsorship opportunities, call 469-206-1690 or email Leah Guskin at lguskin@jfsdallas.org. Crafts on Wheelz was there when Ella Sharoni celebrated her 11th birthday, the birthday girl (third from left in the back row) and her friends made dream catchers. Sticky and bedazzled crafts? Check. Birthday parties brighter than all the colors of the rainbow? Crafts on Wheelz party bus has that, too. Driven through the entrepreneurial get-up-and-go of owner Jill Rashdi has the creative spark to make birthdays memorable. With eight different parties to choose from, themes of superheroes, unicorns, sports, and whatever else one’s imagination can allow, Rashdi brings the party to any location. Setup, cleanup, and everything in between are hers to provide; the partiers only need to celebrate. With the popularity of food trucks and game and other mobile experiences, she has taken her act on the road. A reconfigured 20-foot trailer, the colorful Crafts on Wheelz can hold birthday parties to a maximum of 16, lasting one-and-a-half hours with three crafts, or events and festivals that can accommodate up to 250, with participants moving in and out of the bus, creating one project. “Guests leave with three treasures: their self-made craft, memories of the experience and the empowerment of working with their hands,” said Rashdi, whose menu of offerings include bottle cap art, tiled pencil holders, clothespin dolls, yarn chandeliers, jewelry-making, tooth-fairy pillow designs, stationery, treasure boxes, journals and more. “Many of our projects are of recycled materials so guests learn lessons about repurposing materials and protecting earth’s resources,” she said. Events can be arranged for all ages and stages, generally allowing for one-and-a-half hours of access to the Crafts on Wheelz Studio (bus), with party leaders, eco-friendly craft supplies, up to three projects per guest, and aprons. Birthdays and other celebrations, team-building or large-scale companywide events can be served by the mobile studio. Holiday hostings, with crafts to represent occasions around the calendar, are also possible. Crafts on Wheelz’s trailer needs 50 feet, streetside or in a parking lot (no driveways), and the bus can travel to public areas, as long as a permit — if required — has been secured by the event’s host. 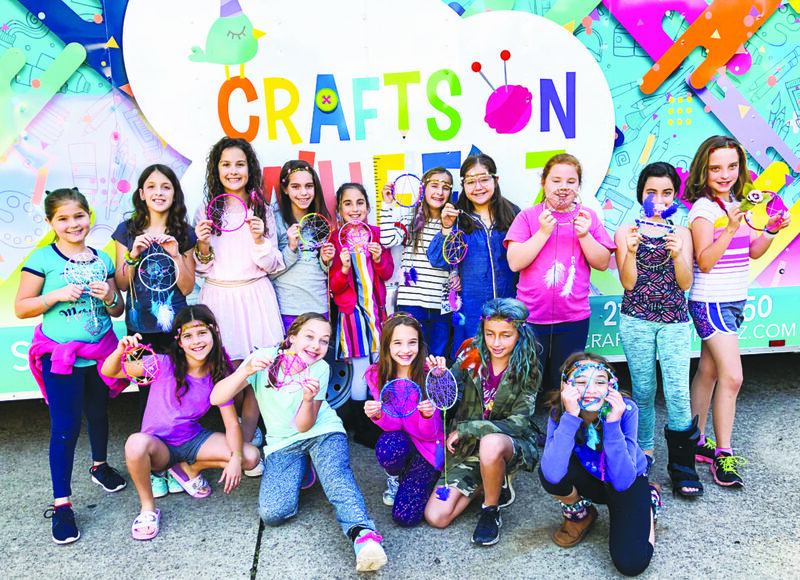 Michele Sharoni hosted Crafts on Wheelz for her daughter Ella’s 11th birthday party, a Boho Chic fest during which the girls made dream catchers. With Sharoni only needing to be concerned about inviting the friends and what to serve, it was a great day for all. “This business combines my passion for inspiring others to be the best they can be with my love of the arts and my desire to stay active and connected to the community,” said Rashdi, a graduate of Greenhill School. She was a member of Zesmer chapter of BBYO, later graduating from the University of Texas with a bachelor’s degree in English, then a master’s in library science. A Dallas native, Rashdi is the daughter of Larry and the late Mimi Goldman and granddaughter of Neil and the late Maxine Goldman and Aaron and Pearl Klausner. The sister of Josh (Jen) Goldman, Mandy (Matt) Erickson, Liz (Clarke) McIlravy, Alli (Josh) Parshall, and Erin Goldman, Rashdi grew up at Temple Emanu-El, her wedding to husband Kobi the last of Rabbi Gerald Klein’s formal occasions. The couple are the parents of triplets Ben, Daniella and Shai. For information or to book an event, visit craftsonwheelz.com, call 214-355-0050 or email fun@craftsonwheelz.com. 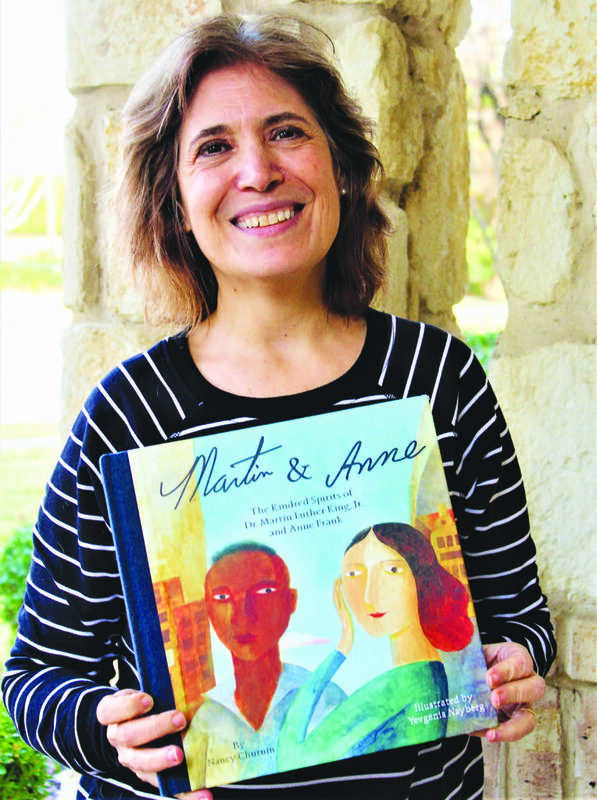 Dallas’ own Nancy Churnin has released her sixth book, Martin & Anne. She will host a launch party from 2-3 p.m. Sunday, March 10, at Interbang Books on Preston Road. Pen to paper, fingers to keyboard, journalist and author Nancy Churnin tells the stories of unsung heroes — heroes of heart and spirit, of gumption and goals. Churnin will celebrate her sixth book, “Martin & Anne — The Kindred Spirits of Dr. Martin Luther King, Jr. and Anne Frank,” released this week, at a launch party from 2 to 3 p.m. Sunday, March 10, at Interabang Books on Preston Road in Dallas. The children’s book is the story of Anne Frank and Martin Luther King, Jr., who were both born in 1929, she on June 12, he Jan. 15. Their lives began a world apart, both facing ugly prejudices and violence, and both answering with words of love and faith in humanity. In 23 pages, beautifully illustrated by Yevgenia Nayberg with designs that “give hope,” says the author, Churnin tells of parallel journeys to find hope in darkness and follow dreams. Their stories include King’s confronting “whites only” signs and Frank’s yellow star-laden clothing, as well as the speech competition he won at 13, the age she was when she began the diary that would tell the world her story. Many of Churnin’s family were affected by the Holocaust, those who escaped — but lost everything — and others who didn’t survive. Her Hebrew name, Nechama, for her maternal great-grandmother, gave her a feeling of heritage, a link to the past. Married to Michael Granberry, the mother of Ted, Sam, David and Josh, Churnin is the daughter of Flora and the late Douglas, and sister of Sharon, Jon and Marc. After a 19-year career with The Dallas Morning News, penning tales for little ones is now her full-time passion. Churnin dedicated “Martin & Anne” to “those whose lives were cut short everywhere, including Bialystok June 27, 1941, your memory is a blessing, and love lives on.” Through her heart and writings, Churnin’s own lost family, and millions more, will never be forgotten. In addition to “Martin & Anne,” Churnin has published “The William Hoy Story — How a Deaf Baseball Player Changed the Game,” “Manjhi Moves A Mountain, Charlie Takes His Shot — How Charlie Sifford Broke the Color Barrier in Golf,” “Irving Berlin — The Immigrant Boy who Made America Sing” and “The Queen and the Christmas Tree — Queen Charlotte’s Gift to England.” In 2020, “Beautiful Shades of Brown — How Laura Wheeler Waring Painted her World” and “For Spacious Skies,” about Katharine Lee Bates, who wrote “America the Beautiful,” will land on bookshelves. To learn more about Churnin’s books and projects, or to have Churnin address a school or organization, visit nancychurnin.com or Nancy Churnin Children’s Books on Facebook. To register for Churnin’s writing class, visit tinyurl.com/churnin-writing-barn. “The history of Anshai proudly reflects a congregation whose roots are deeply embedded in the fertile soil of the greater Jewish community,” said Rabbi Stefan Weinberg (left), who has led Congregation Anshai Torah since its beginning, sharing the pulpit with Rabbi Michael Kushnick for the last six years. Congregation Anshai Torah is celebrating 20 years as a family, a spiritual home, a place to grow, to learn, to pray, and to build one’s Jewish stronghold. Together with the greater community, that celebration will break out at 6 p.m. Sunday, March 31, at the Hilton Granite Park Hotel. Gathering to party like it’s 1999, the event is open to the public. “It’s been a supreme honor to lead Anshai Torah from its outset on July 1, 1998. To witness the pride, joy, and spiritual fulfillment experienced by so many who never dreamed of creating a synagogue has been the most exciting aspect of my leadership,” said Rabbi Stefan Weinberg. “The nurturing of our congregation has been a labor of love and to have shared this journey with Wende z”l, and a dedicated and passionate cadre of others, have been some of the most meaningful blessings in life. The evening will offer food from Simcha Kosher Catering, a photo montage and program honoring the congregation as well as Dot and Basil Haymann (among the congregation’s founders) and entertainment and dancing with the music of the Jordan Kahn Orchestra. Co-chairs Ashley Grossfeld and Julie Haymann, along with Beth Berk, Cathy Brook, Dot Haymann, Marcy Kahn, a dedicated committee and Anshai Torah’s staff, are planning a night of fun and honor. Anshai Torah’s family tree began with roots in Anshai Emet and Shomray Torah. •1998: They formed their first joint home on Village Creek Drive. Those roots have grown branches and generations with more than 550 families. • Sept. 3, 2001: A march of Torahs and ruach made its way to Anshai Torah’s permanent home on Parker Road in West Plano. •2004 marked the first of many congregational trips to Israel. •2005: The voices of the Kol Rina men’s a cappella choir first sounded. •2010: The Behringer Sanctuary was built. •2011: Anshai Torah’s Illustrated Torah arrived. •2013: Rabbi Michael Kushnick joined Rabbi Weinberg. •2017: Light began shining through in a more colorful manner, stained-glass panels at the front of the sanctuary now complemented by 12 encircling the sanctuary, depicting the tribes of Israel. •2018: Project 613 brought Wende’s Torah, the first congregational Torah written specifically for them — in memory of its late rebbetzin. A melding of families, Anshai Torah will toast the Haymanns, who have been involved since their arrival from Johannesburg, South Africa, in 1978. Originally members of Anshai Emet, they are among many who have contributed to two decades of success at the shul. The Haymann family includes children Gary (Julie), Sandy (Andrew) Marks and Tracy (BJ) Elliott; and grandchildren Abby and Alex Elliott, Eli, Izzie and Kaya Haymann and Adrianna and Jake Marks. The Haymanns have shared to Anshai Torah the ark that houses its Torahs, the Haymann Foyer and Menorah — which stands 20 feet tall at the synagogue’s entrance — and a Torah rescued from Tehran, donated in memory of Basil’s father Fred and the couple’s late son Clinton. The Haymanns’ children have taken their example to heart. Rabbi Weinberg reflected on the congregation’s two decades. To RSVP, for sponsorship opportunities or to participate in the tribute book (by March 8), visit tinyurl.com/anshai20.